More first date tips. Shower at least once in the previous 5 days. Get dressed at least 30 minutes before you leave. Don’t bring your date from last night as color commentator. Ha! I knew it would be Victor! Food and robot? Does not compute. I’d never go to all that effort for a first date. I’d quite literally just make sure I have a clean pair of jeans and a shirt and be off, no stupid dresses waying me down. Um … I think that empty space across from him is an indication that his date left in a hurry. A big hurry. Oddly enough, this comic could’ve been made outside of Fantastic Four week. Not necessarily, Victor did have a thing for Sue. 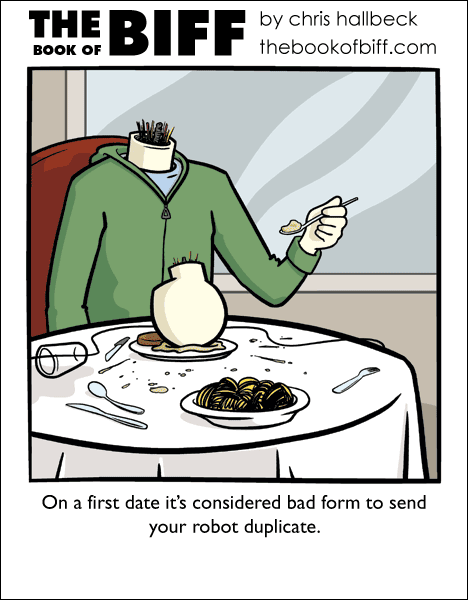 Wouldn’t it be even worse to send your robot duplicate on a second or third date? It’s just a date. It’s certainly not worth losing your head over. At last, the secret of Biff’s survival is revealed. All of the horrible things we thought were happening to Biff actually happened to his ubiquitous Biff-bots. Maybe his date didn’t run away… maybe his date is YOU! That’s what happens when you buy parts that fell out of the back of the truck. I’m more surprised the robot duplicate would don such a gaudy jacket. Not that I have the exact same jacket hanging on my door or anything. Huh-uh. Nope. Also, this week’s theme was my favorite ever. I think Biff(s) would make for a better Fantastic Four than the actual heroes do. he would have known where to go to get a better Biff. This would also fit a theme of 4. Bill & Ted, two of each. Plus Death. This one could also be titled “Nick,” but that wouldn’t fit in with Fantastic Four week. That was the plot of a short story by Robert Sheckley, “The Robot Who Looked Like Me”. A man buys an illegal robot duplicate of himself to court a woman, because he doesn’t have the time. But it turns out she didn’t have the time either and did the same thing. In the end the two robots run off with each other. Mad David: Ah! I think I’ve got it. Nearly Headless Nick? ‘Nearly’ because we all know the head’s going to be back there in place on Monday as usual. Or that is… as usual goes with Biff. Nice try, but I was referring to Nick Fury, who is always getting robot doubles of himself killed off. I wonder if it’s bad etiquette to pick up your date in a rocket. Not really … in fact I’d highly recommend it. It worked for me! So THATS where my spare biff-robo 3000’s head went! …ill pretend i DIDN’T just say that.